Companies outsource today to reduce cost, increase flexibility, and focus on core competence. Outsourcing is not a fad, but strategic lever organizations utilize to meet their planned objectives. Outsourcing led transformations have become a mechanism for generating economies of scale, specialization, and standardization. Let's face it most outsourcing initiatives fail to deliver the expected value. The wisdom isn't a secret - the companies succeeding in this journey invested in building the right competencies, proper governance, and support structures to manage these initiatives. The Customer Centric Service Competency framework introduced in this book essentially brings forwards the service orientation and integrates outsourcing successfully with the usual business of an IT organization. The service framework encompasses thirty key competencies that can be implemented over the duration of outsourcing initiative. Implementation of the services framework will also bring together skills in areas of program management, service management, vendor management, and relationship management. This book is sweeping and perhaps innovative - for it introduces an integrated view of core services and process centric competencies to succeed with outsourcing. It also brings forward a matured competency based method to managing vendor relationships - more art than science. The information contained in this book, when applied in context of your organization, will emerge several areas of efficiencies you may benefit by implementing. -Innovative services based approach and practical insights into implementing outsourcing strategy, core capabilities and their strategic alignment with business. -Written for novice as well as experienced buyers and service providers. -Guides IT professionals to simplify application of outsourcing - improving accountability across outsourcing value chain, and improving benefits. -Provide easy to understand tools, techniques, and best practices to manage outsourcing programs and provider relationships. -Improve service focus for outsourcing programs by enhancing productivity, reliability, responsiveness, competency, and maturity. -Guide for providers to position themselves as trusted advisors. Sanjay Chadha is one of Outsource’s most popular columnists, and with good reason: he consistently delivers - across an impressive array of topics - an invaluable combination of high-level insight and granular analysis which appeals to the rookie and the veteran alike. Furthermore, he does so in a voice that amuses and impresses in equal measure; it’s always a delight to receive another Chadha column in my in box, and I know my readers feel the same. I’m delighted and honored to have played some small part in bringing this book to fruition and I look forward to many more pearls of wisdom in years to come. Sanjay Chadha brings forward a very practical and well balanced perspective based on his vast experience of working on both sides of the outsourcing business; as a buyer and service provider of IT services. This is a must read for buyers currently outsourcing and service providers interested in learning how seasoned buyers leverage outsourcing to derive competitive advantage. Sanjay Chadha has offered a compelling critique of conventional IT outsourcing that can benefit everyone in industry - service providers, consultants, and buyers. This book will challenge you to think about outsourcing and vendor relationships much more strategically. 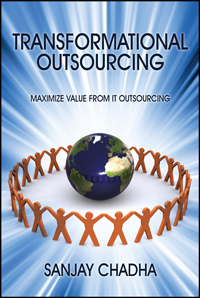 It provides critical insights to derive enhanced value from outsourcing as a service. A new concept and a must read! Sarvi Dhaliwal, CEO — Intellect IT, LLC. The services framework shared in the book is born of deep experience, and Sanjay meticulously layers a foundation for outsourcing that many industries leveraging IT will find invaluable. Here you’ll find a complete and insightful approach that any organization would be advised to consider. Sanjay Chadha is an outsourcing expert who understands the strategic value of outsourcing. He brings forward a wealth of knowledge, creativity and experience in managing large outsourcing programs and relationships. His leadership and passion for outsourcing as a profession is admirable. I have enjoyed working with Sanjay. It is exciting to see him translate his wealth of knowledge into this book. SANJAY CHADHA is an IT sourcing management expert. He currently manages the Global Sourcing Office and strategic outsourcing relationships for a large financial services company. His expertise areas include, sourcing led transformation, planning and implementation of sourcing strategy, governance, and set-up and management of outsourcing office and shared services. 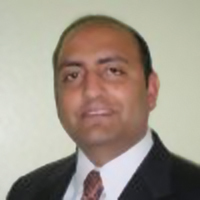 Sanjay has strong leadership experience in areas of IT Outsourcing (ITO) and Business Process Outsourcing (BPO). His expertise areas include planning and implementation of sourcing strategy, business case, governance, negotiation of complex contracts and set up and management of program office (PMO). Sanjay has led several complex outsourcing transformations that required large-scale transition and optimization of steady state operations. He brings forward extensive hands-on experience with several capabilities required to manage outsourcing. He has a proven record of accomplishment of streamlining processes, reducing Total Cost of Ownership (TCO) and delivering superior outsourcing value and performance. Sanjay’s experience also includes set-up of vendor management offices, contingent workforce offices, vendor consolidation, and vendor transitions, in sourcing, domestic sourcing, expense management, purchasing, and leading vendor risk management audits. Sanjay is also an expert with leveraging outsourcing standards and frameworks in context of outsourcing needs. Sanjay received Masters of Science (Quantitative Analysis) and Masters in Business Administration (Marketing & Information Systems) degrees from University of Cincinnati, USA and a Bachelor of Engineering (Mechanical) degree from University of Rajasthan, India. Sanjay is a Certified Outsourcing Professional, COP, Certified ITIL Foundation and professional member of IAOP. He is also a regular columnist for the Outsource Magazine, a publication of EMP Plc, UK.